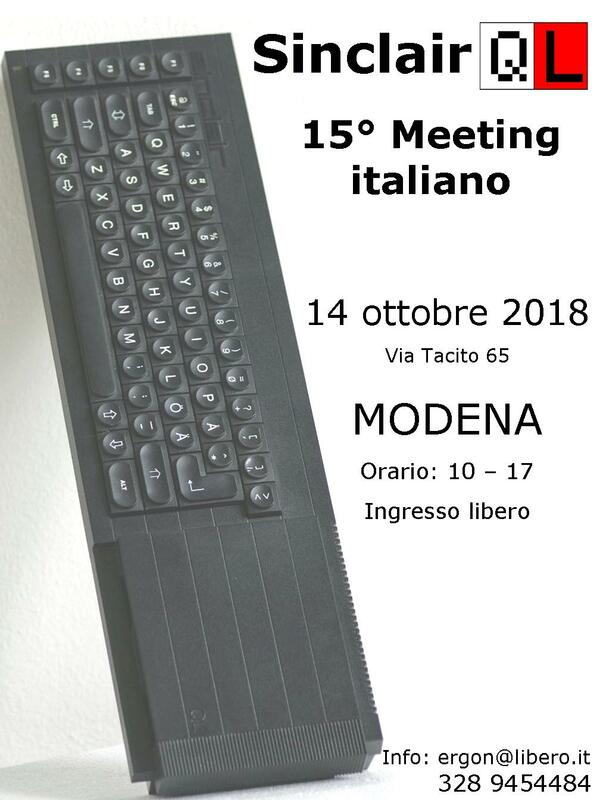 The 13th Sinclair QL Italian meeting will take place on Sunday 14 October 2016 at DTM Technologies premises in Modena. We will start around 10:00 and the meeting will continue till 17:00 with a break of one hour for lunch in the nearby shopping center. As for the last two Italian meetings we will organize educational sessions, we will have presentation of ongoing projects in Italy and we hope to organize teleconferences with overseas users; to reserve your connection session the details will be provided separately to the interested persons. Take the exit Modena Nord on the A1 motorway (0 Km – toll gate). After 0,5 Km you will reach a roundabout (A). Remember to keep the left lane before reaching this roundabout. Take the exit for “Fiera” (270°) and you will pass over the A1 motorway. You will soon reach another roundabout (B – 1,3Km). Take second exit direction “Reggio Emilia – SS9”, you are now in Viale Virgilio. At the next roundabout (C – 1,7 Km)) take the 2nd exit following the direction “Reggio Emilia SS.9”. On your left you will find the “Metro” shopping mall. Just after the flags and the bus stop (2,0 Km) turn right in Via Omero. At the next cross-road turn right in Via Tacito (2,3 Km). DTM is located at the end of the street (2,5 Km) in the corner of the building on your left. You will find a traffic light (D) and if you arrive from Reggio Emilia on your left (or on your right if you arrive from Modena) you will see a very big sign showing the current exposition in Modena Fair. Turn there, after 200m just before the bus stop and the flags turn right into Via Omero. After 400m turn right in Via Tacito. DTM is located at the end of the street in the corner of the building on your left. Stop at Modena railway station. Then take a TAXI or in alternative take Bus n.9 that stops in front of “Metro” shopping mall (then follows the instructions given above). You should ask for the stop “Viale Virgilio – Metro”. Please note that some of these buses does not stop in Viale Virgilio but proceed directly towards Rubiera. In that case you have to stop in Via Emilia beside the big “Grandemilia” shopping centre. Then you will have to walk for 5 minutes to reach DTM.